You may have heard the name Jungfernstieg quite often in connection to Hamburg, but because this is very big area I want to share my favorite spot at this famous sight of Hamburg. The Jungfernstieg basically is the street in front of the inner Alster which used to be the place where families took their daughters to find a suitable husband. Luckily, times have changed. Nowadays, this area is probably one of the most crowded places in Hamburg. Young kids are playing around, teenagers meet their friends and sometimes there are some acrobats trying to impress. 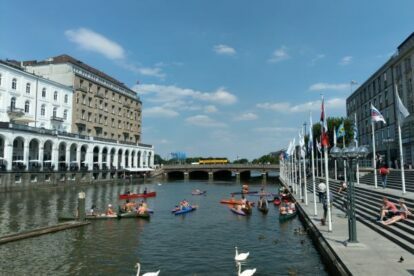 Most people relax and watch the Alster, spend their lunch break in the sun or just have a little walk around the lake. The place where the picture was taken is directly located at the town hall square. It’s not that packed with people like the most famous promenade, but you can really take a break from what you are doing there. Sit down at the stairs, take a book or get an ice cream cone and watch the swans, the people or the little boats waiting for the gate locks to be opened. What I like is that you don’t have the big street right at your back, so it’s not that noisy. Keep this place in mind when you are out shopping in the Mönckebergstraße or the fancy shops at Neuer Wall.